For decades, Phuket has been one of Asia’s premier beach destinations, but more recently, Phuket has developed into a medical tourism hotspot. Phuket offers numerous international standard health facilities including hospitals, clinics, spa and wellness facilities, making it a truly great wellness vacation destination. It is estimated that medical treatment in Phuket costs up to 1/2 or 1/3 of the equivalent in Singapore, 1/5 of the cost of in Western Europe and about 1/8 of the cost of USA. Bangkok Phuket Hospital – This hospital offers state of the art technology, highly qualified English speaking medical professionals, JCI-accreditation and is one of the biggest hospitals in Phuket and in Thailand. Phuket international Hospital – This was the first hospital on the Island to provide medical treatment to tourists as well as promoting medical tourism in Phuket. Some of the reasons for Phuket’s popularity as a destination for surgery and health treatment are the availability of first class health facilities, spas and holistic services, idyllic beach location, solid infrastructure, great food and the traditional Thai Hospitality, allowing people to combine vacation/holiday with treatment. Phuket provides a relatively cheap alternative to paying the soaring healthcare costs in the western world, like Europe and USA, from lifesaving procedures through to annual medical check-ups. Often, even after the inclusion of hotels and flights, medical treatment works out to be cheaper and Phuket’s provides all the necessary ingredients which aid in recovery from your medical procedure, in beautiful surroundings. 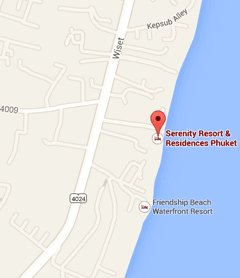 Serenity Resort & Residences is an ideal destination for medical or wellness holidays. Guests can take time to relax and recover from medical procedures in a peaceful and relaxing setting.